It’s been a while since we’ve written about the proposed Pebble open-pit copper/gold mine in southwest Alaska. In January 2007 one of the world’s biggest mining companies, Rio Tinto, increased it’s ownership stake in Northern Dynasty Minerals to almost 20%, a clear sign that they are banking on ultimate approval of the Pebble mine by the state government. Northern Dynasty is a small Canadian mining company with no experience actually building and operating large mines. Rio Tinto, on the other hand, owns and operates some of the biggest mines on the planet: they’re co-owner of the massive Grasberg open-pit copper mine that’s smothering lowland rainforest in Irian Jaya, Indonesia, as seen on these SkyTruth satellite images. And in July 2007, international mining giant Anglo American acquired a 50% stake in the Pebble project. Philip Mattera produced a critical report looking at the global operations of Anglo and their subsidiaries. Pebble mine proponents received encouragement in 2008 when Alaska citizens voted against a ballot initiative that would have prohibited new mines in the state from discharging pollutants that could harm humans or salmon. 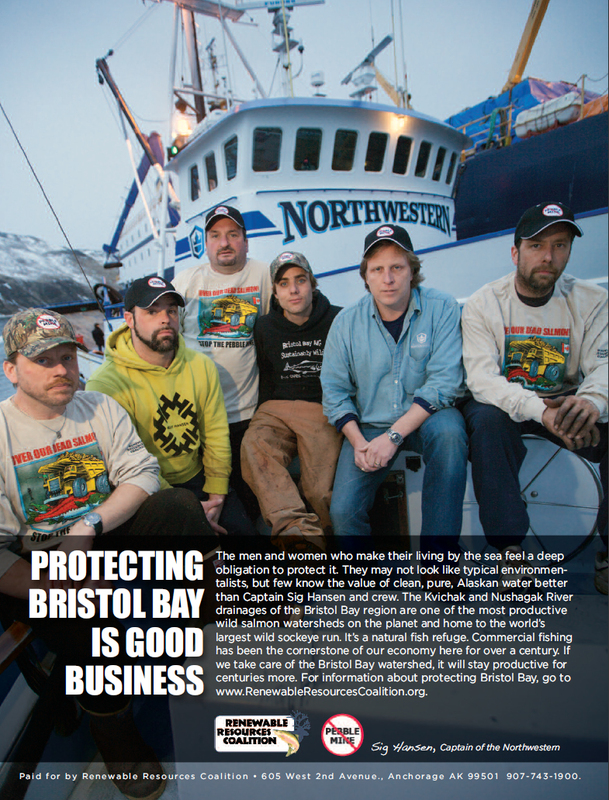 Mine opponents — commercial fishermen (including Sig Hansen, captain of the Northwestern for all my fellow Deadliest Catch freaks), sportsmen and environmental groups — remain concerned about the potential impact of large-scale mining operations in the headwaters of Bristol Bay, a wild-salmon fishery that’s worth $400 million per year to the state. Some suggest that even the perception that wild-caught salmon in this area might be tainted by mine pollutants could scare off consumers and hurt the fishing industry. 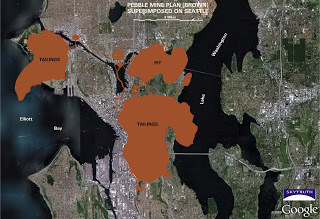 Proposed pebble open-pit mine superimposed on the city of Seattle for scale. 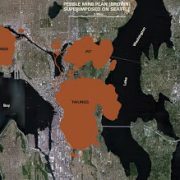 We’ve superimposed the Pebble mine plan on Seattle to give you a feel for just how big this mine would be. 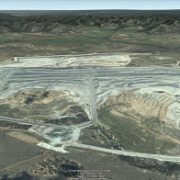 It features an open pit that would cover 1400 acres, and two huge tailings impoundments of 2500 acres and 5000 acres that are bounded by a series of 5 earth-and-rock-filled dams. The larger of the impoundments will feature a 700′ tall dam almost four miles long – the largest dam in the world, ultimately holding back a 2.5 billion-cubic-yard slurry of tailings nearly 700′ deep that covers more than 6 square miles. For comparison, China’s Three Gorges Dam is 607′ high and 7,575′ long. And, like most of Alaska, this area is known to be seismically active, so these impoundments – which need to hold back the contaminated mine tailings for eternity – will likely experience major earthquakes. See all the SkyTruth maps and images here. 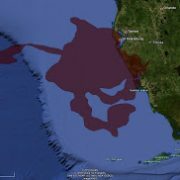 Cumulative Timor Sea oil spill footprint superimposed on Florida’s Gulf coast. This is based on SkyTruth’s analysis of MODIS satellite images provided by NASA throughout the event, from August 21 to November 1. Read all about it in this blog; see our large collection of images and maps; and follow us on Twitter to stay tuned in on all our latest work. And if you like what we do, and want us to keep at it, please make a donation – SkyTruth is a 501(c)(3) non-profit organization registered with the IRS, and your donation is fully tax-deductible. We’ve generated a sequence of maps showing the cumulative area of ocean covered by oil slicks and sheen during the 10-week oil spill in the Timor Sea off Australia last year. This is based on SkyTruth’s analysis of MODIS satellite images obtained from NASA throughout the event. 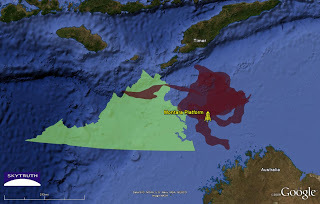 Cumulative slicks from Timor Sea blowout and spill; state of Virginia superimposed for scale. We calculate a total area of 22,163 square miles where oil slicks or sheen occurred at some time during the spill, which began when a well blew out during drilling operations on the new Montara platform on August 21, and ended when the damaged well was finally plugged on November 1. This is about the size of SkyTruth’s home state of West Virginia. 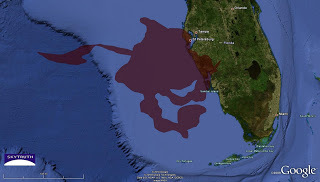 Because there were many days when the MODIS images weren’t useful for mapping slicks (due to cloud cover or illumination conditions), the actual area is probably greater. It would probably surprise a lot of folks – especially here in West Virginia – that the world’s biggest exporter of coal is… Australia. 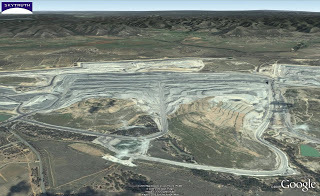 Strip mines have been growing rapidly in the Upper Hunter Valley region of New South Wales, bringing some painful transformations as local economies lose diversity and become dominated by resource extraction. Panoramic 2007 satellite view overlooking part of the Upper Hunter Valley coal-mining district. Google high-resolution satellite images taken in 2007 clearly show the expanding footprints of the dozens of active mines spanning the region. Browse this SkyTruth gallery to take a brief virtual tour.